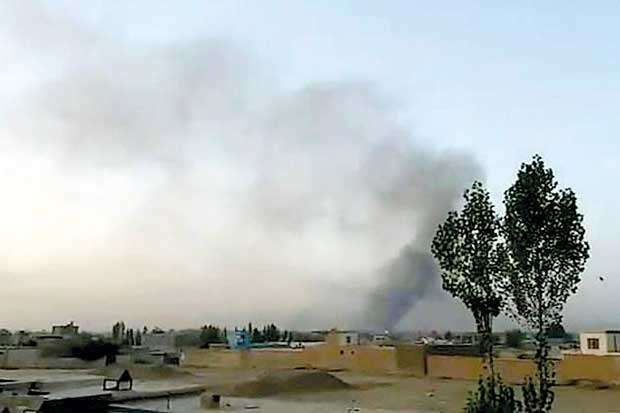 Heavily armed Taliban fighters attacked the strategic central Afghan city of Ghazni on Friday, burning police checkpoints and seizing control of parts of the centre before being driven back by U.S.-backed forces, officials said. U.S. attack helicopters and drone aircraft provided government forces with air support. But with Taliban fighters believed to be hiding in residential areas, it was unclear whether the government had full control of the city. The attack on a city straddling the main highway between the capital Kabul and southern Afghanistan was a show of strength for the Taliban, underscoring how volatile the security situation remains less than three months before parliamentary elections in October. The defence ministry in Kabul said the attackers had been beaten back but were still present in one area of the city and had occupied civilian houses, from where they were still keeping up occasional fire on security forces clearing the area. It said around 150 attackers had been killed or wounded but gave no estimate of casualties for civilians or security forces. A local health official said at least 16 people had been killed.